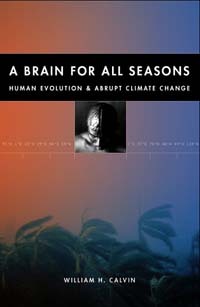 William H. Calvin, A Brain for All Seasons: Human Evolution and Abrupt Climate Change (University of Chicago Press, 2002). See also http://WilliamCalvin.com/BrainForAllSeasons/NWT.htm. [The epic learning game we call science] formalizes our special kind of collective memory, or species memory, in which each generation builds on what has been learned by those that came before, following in each other’s footsteps, standing on each other’s shoulders. Each generation values what it can learn from the one before, and prizes the discoveries it will pass on to the next, so that we see farther and farther, climbing an infinite mountain. Looking down at the frozen tundra around the various chilly lakes below, I tend to see methane deposits, which isn’t much better than seeing salt problems and ice dams breaking. The northern parts of Canada, alas, are exactly the areas that warm up first, in the computer simulations of global warming. A thaw from global warming is predicted to release the methane in the tundra – a greenhouse gas – and so make things still warmer yet. Cooler can promote colder, too. Consider the effects of the high winds that blow during the cool-and-dry mode, carrying dust off the continents and fertilizing the algae in the oceans. This promotes more CO2 removal and thus less greenhouse warming. Also, more ice at the higher latitudes makes the earth’s surface whiter, and so reflects more of the sun’s energy back into space, which cools things off even further. Whiter and whiter becomes colder and colder. Indeed, as I mentioned back in Germany, the earth is now thought to have become completely covered with ice and snow on some occasions, all of the land and sea surfaces white except for a few hot springs areas such as Iceland. This may have happened multiple times back about 600-800 million years ago. What keeps “Snowball Earth” from being permanent (“The White Earth Catastrophe”) is that volcanoes still vent CO2 to the atmosphere and that this slowly causes a greenhouse warming that finally melts back the tropical ice. There are many evolutionary implications of Snowball Earth because of the island biogeography it implies. The volcanic hot spots in the ocean also provide a wonderful route for different animals to have evolved in isolation without competing with one another for long periods, exactly what would help explain the Cambrian explosion of different body types (all those several dozen phyla) at 530 million years ago. Whereas positive feedback boosts (recall those self-perpetuating droughts back at Lake Naivasha, page 159 ), negative feedback fights back, serving to minimize change. If the bigger-and-bigger avalanche is the main metaphor for positive feedback, then the prosaic household thermostat is the main metaphor for negative feedback. The classic earth sciences example of a thermostat is the way volcanic CO2 is removed from the atmosphere by weathering rocks. The chemical reaction between the rocks and the CO2 in the falling rain depends on temperature. The volcanic CO2 may make things warmer via the greenhouse but that slowly increases the speed at which weathering removes the CO2, suggesting a balancing act. Let it cool for some reason and the weathering slows; the volcanic CO2 can build up again and so produce a greenhouse warming. 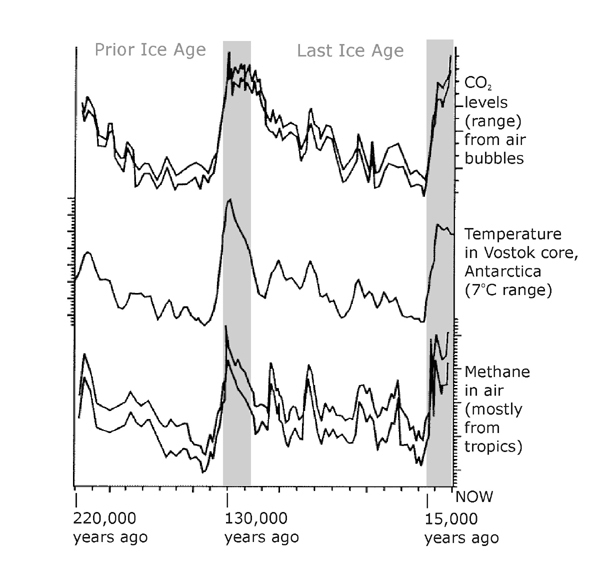 However, this effect seems not to be strong enough to prevent CO2 rising during a warm period in the ice ages. There’s an even quicker-acting possibility for negative feedback: More warming might create more clouds over the tropical oceans, their whiteness reflecting more of the sun’s heat back into space and thereby cooling things somewhat. Again, no one is certain about the strength of the effect. Some things may balance out for awhile. Indeed that is what the greenhouse effect is all about, so let me give you the short version of greenhouse physics. The earth is heated by sunlight but the warmed earth surface creates infra-red radiation that escapes back out into space. The earth, however, has an atmosphere which traps some of this heat loss, as when clouds keep it from becoming so cold at night. The atmosphere is not as transparent to infra-red wavelengths as it is to the incoming light (the same is true of glass, and so the same principle operates in a greenhouse or a car parked in the sun). The atmosphere’s insulation blanket comes mostly from water vapor and carbon dioxide (and with minor contributions from methane and nitrous oxide and ozone), the so-called greenhouse gases. The amount of energy coming in has to balance with what escapes (or else the earth’s temperature will keep changing until it does balance). Add more greenhouse gas, and the earth will heat up until it can produce more infra-red, enough so that what gets past the greenhouse gases will balance the accounts. Let the water vapor or some other greenhouse gas be reduced, and the warm earth will be losing more heat than it gains from sunlight. And so it cools. The accounts will eventually balance again at some lower temperature. There is nothing intrinsically slow about these temperature changes. You know how fast a cloudless night can cool the earth, compared to a cloudy night. Were the winds to reduce tropical evaporation by one-third in a year, you’d see an abrupt shift from warm-and-wet to cool-and-dry. Negative feedback often overreacts and produces oscillations, which is why people are always fiddling with their thermostat. Just the right amount of negative feedback can produce homeostasis, neatly stabilizing things, but often the various competing processes operate on different time scales, making it hard to keep things balanced. Unfortunately, the climate records are full of evidence that the perfect balance is seldom achieved, certainly not on the time scale of the lifetime of a civilization. Concentrating on one “cause” at a time is sometimes a good strategy - and sometimes one is all the human mind can juggle, if it has lots of parts and pieces. When many causes all interact – and abrupt climate change candidates include the thermohaline circulation, the atmospheric circulation associated with the North Atlantic Oscillation, changes in tropical evaporation, and changes in albedo – the human mind needs some help. For the big picture, you need a working model of oceans and climate. The feedbacks can be studied in the global climate models running on the big computers. To stabilize our chattering climate, we’ll need to identify all of the important feedbacks that control climate and ocean currents, and estimate their relative strength and interactions. The feedbacks are what determine the tipping point, where one mode flips into another. Near the threshold, you may sometimes see abortive responses, rather as you may step back onto the curb several times before finally running across the busy street. Abortive responses and rapid chattering between modes are common problems in nonlinear systems with not quite enough oomph, the reason why old fluorescent lights flicker. To keep them firmly in one state or the other, you try to keep them away from the transition thresholds. That’s what we need to do with climate – keep it firmly in the warm-and-wet mode, and not let it come anywhere close to the transition zone that could kick us back into the next ice age. It’s much like building flood-control dams, and whether you design for a “fifty-year flood” or a “thousand-year flood” – except that these disasters are felt around the world. For abrupt cooling, you want to make sure that no decades-to-centuries climate variations such as El Niño and the North Atlantic Oscillation can cross the threshold of the slippery slope to abrupt cooling. Of particular importance are combinations of them, which may have much larger effects than their linear sums would ordinarily suggest. Some scientists have sought comfort by noting that extrapolating trends in atmospheric CO2 show that the northern Gulf Stream circulation might not shut down for another 400 years. Personally I take little comfort in this, in part because my doctoral dissertation many decades ago concerned fluctuations in a threshold system (in nerve cells, but the principle applies elsewhere; in stochastic processes, it goes under the name of the “first passage time problem”). Steady trends, in real life, have fluctuations superimposed on them. Construction projects usually take longer than estimated because of delays, but quicker-than-expected is what you instead get from the climate systems. The comments about the time to shutdown of the northern Gulf Stream are about like extrapolating the slow rise in sea level to estimate when the nations of the Indian Ocean on low islands will finally be covered up. They will, of course, be rendered uninhabitable far sooner because of the fluctuations in sea level caused by unusually high tides associated with storms. Let a low pressure system be centered over the islands at an extreme high tide, and seawater will flood the islands and salt up the fresh water supply. This considerably shortens their time remaining. The same thing holds for our present extrapolations of North Atlantic models: they simply do not yet take into account such fluctuations as El Niño and the North Atlantic Oscillation, nor freak “random” combinations of weather that set up self-perpetuating regional droughts like the Dust Bowl. None of these are likely to delay the threshold-crossing year; they are only likely to shorten the time remaining until the slippery slope is reached and the climate flips. And besides the “natural” contributors, we have human ones associated with cutting down forests and burning fossil fuels. It’s like estimating the time until the bathtub overflows when the water is left running: it makes a lot of difference if there is also a kid in the tub, bouncing around. This never delays the time until overflow; it only makes it happen sooner. At the moment we are an ignorant species, flummoxed by the puzzles of who we are, where we came from, and what we are for. It is a gamble to bet on science for moving ahead, but it is, in my view, the only game in town.